Research shows that the data preparation process is estimated to take up to 80% of the overall analysis time. For businesses, this continues to be a major barrier to getting quick and accurate analysis. The data preparation process allows anyone to quickly turn any raw data from multiple sources into refined information assets so it can be used for accurate analysis and valuable business insights. The self-service data preparation process is quickly becoming a skill that is required for an increasing number of data analysts, data scientists and business users. These individuals have been learning and adopting this new skill to support their daily business intelligence activities and analytic initiatives. To date, the tools available have been somewhat limited to Excel or other spreadsheet applications. As a result, it’s not always clear what a data preparation process should be, who’s responsible for it and how it fits with the current analytics practice. The data preparation process also known as data wrangling, is an entirely new method to manipulate and clean data on any volume and format into a usable and trusted asset for analytics. Trifacta Wrangler is an easy-to-use, self-services data preparation tool that allows IT, business users and data analysts to easily explore, cleanse and transform diverse data of all shapes and sizes. Accelerate the analysis process with a more efficient, intuitive and visual approach to preparing data for visualization. Expedite data manipulation and cleansing activities so the user can focus on the real job of analysis. Expand the variety and complexity of data used in analysis to gain better and more valuable insight. 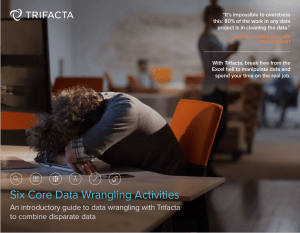 Trifacta has created an eBook to help you better understand the value of wrangling data and our unique approach to the data preparation process. To learn more about the data preparation process and how to quickly gain valuable insight from your data, download our ebook: The Six Core Data Wrangling Activities and put the steps to work for you.